Work has gone from 0 to 100 in a very short span of time, I’m slightly sleep deprived, trying to keep up with my social calendar, while planning my vacation for next week. (I’ll be in Japan during the week of NHK! Is figure skating popular in Okinawa too? A tropical paradise doesn’t seem like a place where figure skating would be super popular…) You can say that life is a crazy whirlwind for me right now. Names on page predictions this week for the Grand Prix of Helsinki. Onwards! Confession: Sara Hurtado & Kirill Khaliavin’s FD to Pink Floyd and Harry Styles’ Sign of the Times is a guilty pleasure kind of program for me. I don’t like the music cuts but the campy drama? I live for it. What are your predictions? And any Japanese readers have any recommendations for things to do/try in Okinawa? I have a feeling the competition is starting soon so here are my predictions really quickly. The Cup of China is always an interesting competition since there’s always that attempt to build the roster to maximize medals for the home team… except there really isn’t much to work with at the moment outside of pairs for China at times. Either way, onwards and upwards! Yes, I know, competition has started. And I haven’t written about Worlds at all. At school, they never teach you that adulting is hard. So many demands for my time so I will keep this short. I should try to correct my rambling writing style anyways. 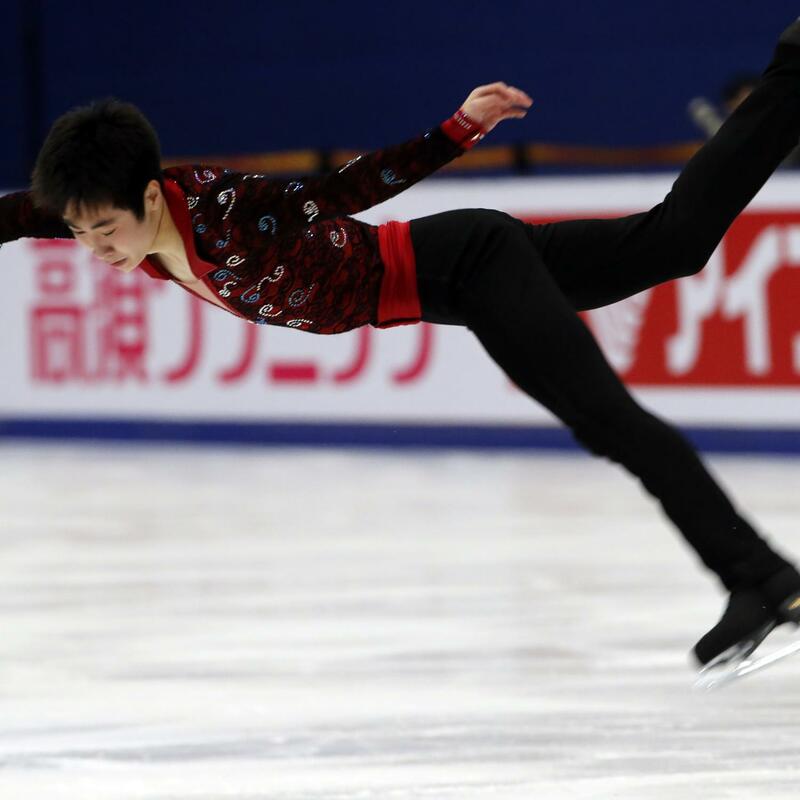 Shoma Uno will be hungry to redeem himself at Worlds. He was crying at the kiss and cry (it was so heartbreaking). I think we all knew that he could’ve been the World bronze medalist. Strange. I thought Boyang Jin was supposed to have gone to Frank Carroll for coaching but I don’t see that on his ISU bio. Wonder what happened. Either way, I hope he’s worked on his skating skills during the off season. Dear Skating Gods – I’m not asking for much. I’ll take boring programs over the secondhand embarrassment I felt watching Maxim Kovtun’s programs from last year. I also hope that Jorik Hendrickx doesn’t put the entire speaking track of a movie in his music this year. Actually, maybe for entertainment value, he should. I had a good laugh over it though my seat neighbours in Boston probably thought I was being creepy. I feel as if I will have to lower my expectations for Mao as she tries to find her step again, as Carolina did after two disastrous Olympic cycles. Ganbare, Mao-san! You should probably be able to discern my feelings on Ashley Wagner’s World silver medal. Regardless of how I feel, the home ice advantage comment should apply here too. Someone give Gracie Gold programs she actually likes. Firebird was frankly worse live and she looked miserable skating to it. The field is pretty thin here so I wouldn’t be surprised if they tried to give 2 medals to the American ladies here. I admit I wached Mai Mihara’s SP for the competition. She lacks musicality, which is to be expected of someone so young but she skates with so much speed and she lands her jumps really smoothly. I’m impressed. Huh. I feel like I should just pick out 3 teams whose names seem familiar and make that my prediction. The field is really, really thin at Skate America this year. The ice dance competition should look like USA vs. Russia with two sets of teams for each country. The Shibutanis should be able to win this with the home ice advantage. I hope they continue in the same vein as last year – as in they have programs really suit them. I would like to see what progress Hubbell & Donohue have made, though I feel as if I have a fondness for this team because of Marie-France Dubreuil & Patrice Lauzon (who I hope will be the new rulers of ice dance – I am ready for the end of the reign of Queen Marina). I really hope that Ruslan Zhiganshin has really stepped up his game this season. It would be a pity for Elena Ilinykh’s talent to go to waste. She alone is better than Bobrova & Soloviev but unfortunately, ice dance doesn’t work that way. What are your predictions for Skate America 2016? Let me know in the comments! I hope everyone had a lovely Easter long weekend! Once my precious days off were over, I realized that Worlds was starting very soon and I had to get my act together and do a Worlds predictions post. My last few predictions have been off the mark but hey, it happens and it won’t deter me from making more. So here goes! Another competition is upon us! The NHK Trophy is the last of the GP series before the Grand Prix Final and I am super excited! In other news, CBC has reported that the ISU will use the standings from the SP as the final standings to calculate who gets into the GPF. This means that my predictions have completely gone into the garbage for TEB but in all honesty, I’m just glad that the skaters are safe. My continued thoughts and prayers go out to all those affected by all of the terrible acts of terrorism around the world.